Discovered 1771 by Charles Messier. Open cluster Messier 48 (M48, NGC 2548) is a conspicuous open cluster in the head of the extended constellation Hydra, almost on its border to Monoceros. This open cluster was discovered by Charles Messier and cataloged by him on February 19, 1771. However, as he did an error in data reduction, he gave a wrong position in his catalog so that the object was missing until Oswald Thomas identified it in 1934, and independently T.F. Morris in 1959. 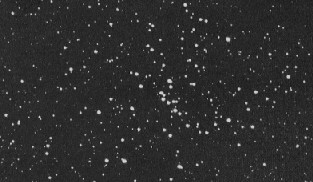 The identification of M48 by Oswald Thomas was confused by some historians, who have claimed erroneously instead that he had identified M47. As M48 was lost, two independent rediscoveries occurred: First, Johann Elert Bode apparently found it in or before 1782, and second, Caroline Herschel independently rediscovered it in 1783; this latter discovery was published by Caroline's famous brother, William Herschel, who included it in his catalog as H VI.22 on February 1, 1786. M48 is a quite conspicuous object and should be a naked-eye object under good conditions. The smallest binocular, or telescopes, show a large group of about 50 stars brighter than mag 13, the total number being at least 80. The more concentrated core extends over about 30 arc minutes, while the outskirts reach out to about 54', corresponding to a linear diameter of 23 light years at its distance of 1,500 light years (given so by Mallas/Kreimer and Kenneth Glyn Jones, while the Sky Catalog 2000 has 2,000 light years). M48 was classified as of Trumpler type I,2,m (Sky Catalog 2000), I,2,r (Glyn Jones) or I,3,r (Götz). The age of M48 was estimated to amount about 300 million years; the hottest star is of spectral type A2 and mag 8.8; its luminosity is about 70 times that of the Sun. 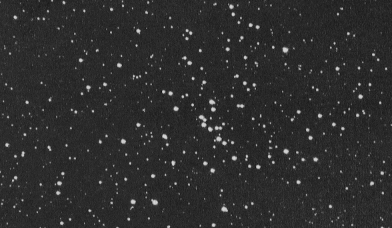 M48 moreover contains 3 yellow giants of spectral types G-K.